This right here? This is going to be da bess review you will ever read in the history of ever. There will be few words but you'll be crying by the time it is over. Crying as you go into the recesses of your mind to relive your childhood with Mario and his many obstacles. Crying because you'll want me to stop writing on account of how terrible this will be. TERRIBLY AWESOME THAT IS! ...Naw, let's reinstate just the terrible part. 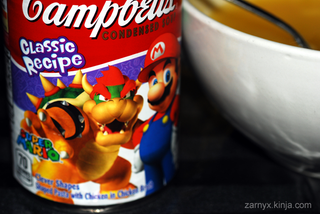 Today, I bring you the SnackTAYku review you definitely never wanted - Campbell's Chicken Noodle Soup: Mario Edition. And to help me is special commentary from one cool brother from another mother, Nach Luigi. Nothing. There's absolute nothing fantastic about this soup. Well, I did kinda like the chicken bits but that is due to my nature at liking food that should not exist. Chicken? Is it really chicken? Who cares. It's chewy and tastes like it wants a soul. Or used to have one? I'm still trying to figure that out. What's not to like? I now fully understand how it is Mario and Luigi can break those blocks. They're made of noodles. Look at how well the shape is maintained even when drenched in soup. A+ construction. Or was it F - - . Hrrrmmm. I've always wondered why there are no blocks in my games… and why I have to hunt for ghosts if I hate them so much! Although… I once read the King of Koopas transformed the Toads from Mushroom Kingdom into blocks, so thinking about it… I'm glad there are no blocks in my games! You know what else does well with water and liquids? Flowers. Ah yes, they wouldn't be able to grow otherwise. It's no surprise that they thrive so well here. What? No green or sign of life? Balder. dash. I get why my bro get's his red coloured flames, I used to have them too… now they're green. I asked Mr. Miyamoto why green fireballs? He never answered back… Sometimes I think I was a mistake. My Deepest Apologies But Who Are You? There is hope for us lovers of Luigi yet. That's right! Make Mario a shadow of his former self! Not the actual Shadow Mario though. No. That's not what's happening here as represented by his misshapen noodle form. ...Or is it? I'll just keep on believing that this was supposed to be Mario and not some mind games Nintendo and Campbell thought of to mess with me. That ain't cool. Maybe they forgot to include me… they usually do, back in the 1980s they dressed my brother in my clothes to make people believe I was part of the adventure! Aww look at that poor goomba! He just needs to get back on the overworld, he was never meant to be part of the water levels! Luigi should be there having his own original adventure in the salty chemical water! LUIGI IS ON THE CAN BUT WHAT THE WHAT?! Luigi, Yoshi and Bowser are good enough to be on the can. But should they be immortalized as noodles that probably have an impressive shelf life? Apparently not. The Year of Luigi may be over but this hits hard. Low blow, Nintendo. LOW. BLOW. Eh… I'm happy I made the front cover! Best Year ever… now to wait another 30 years for my year to come back! Editor's Note: The above picture is actually a shot from the back of the can. Let's just let him continue to believe in things that keep him happy. For a truthful conclusion as the soup, well it's thin. It doesn't taste too bad in a pinch but you'll really be getting this for the fun Mario shapes. Which is perfectly acceptable, just do not expect to be wow'ed by the actual meal. Or maybe you will be. Sometimes, nostalgia in a warm bowl of Campbells soup is all you need. I think this is the second time I've actually eaten a Campbells soup so that is all lost on me. I don't know why I'm bothering to make up your childhood either. Maybe you never had it! I have no idea. Commercials always lead me to believe otherwise. No mushrooms in the soup makes Luigi sad, but to be honest I don't like Campbells soup. My brother does, that belly he has is from the retained liquid thanks to the sodium from the soup. Visit TAY Classic where there is no soup for you. There are however, discussions about life, video games and anything you want. Join in one or start one of your own. Just make sure that one of your tags after the relevant ones is 'TAY Classic" and you're good to go. Got more questions on how TAY works? Check out the tutorial.